If you see a rather large, black wasp with an iridescent blue tinge and brilliant orange ring on its body. Kill it quick! Spray it, swat it, stomp on it. It is the adult female of the peach tree borer. This insect is not really a wasp, it just looks like one when you first glance at it. If you look closer at it you will see it doesn’t have that distinctive pinched body shape like a wasp. A peach tree borer moth zooms quickly when it flies, very similar to a wasp. Most moths we see sort of bounce around when they fly, much like a butterfly. None of that lazy zig-zagging around for them. So actually, it won’t be very easy to stomp on them. I spotted both male and female adults separately. Then a day or two later, I witnessed a pair mating. Unfortunately, I didn’t have my camera with me either time to get a photo for you to see. It is not the adult that directly harms peach trees, it is the larval stage that does the damage. The adult female lays its eggs on the bark of the tree near the soil line. Once the egg hatches, the tiny larvae start chewing their way into the inner back. There they feed and grow, burrowing their through the lower trunk of the tree. You can imagine how destructive this can be to a tree. The tree is either weakened so much that it becomes susceptible to other pests or it may, more likely, die outright from the damage. Since the adults are mating and laying eggs right now, you may want to try using a preventative insecticide spray. Drenching the truck and lower branches with an approved insecticide may kill the newly hatched larvae before they have a chance to bore into the tree. Once the borers are inside the tree, they are protected from sprays. At that point the best thing you can do is look for holes in the lower trunk made by the borers. Scrape away the bark and feeding debris. Be gentle, you don’t want to cause even more damage. Check the spot in about a week. The active areas will have new frass and other debris. That’s where the borers are living. Make a vertical cut through the borer hole then poke a piece of thin wire into the feeding tunnel. If you’re lucky you’ll kill the borer. It’s a lot of fussing around but you may be able to save your tree. There is another similar insect called the lesser peach tree borer that feeds higher up on the trunk. The adults look somewhat different but are just as destructive. Our garden has become a haven for baby tree frogs. Standing in one spot without having to move, I could see three of them. I’ve also seen many others hopping around in the yard. 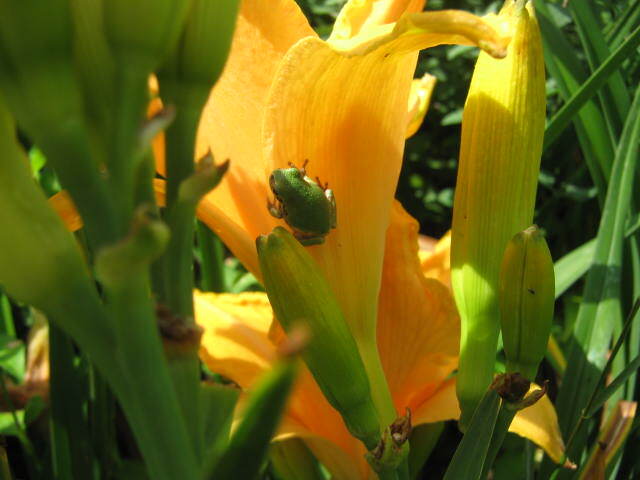 The bright green frogs stand out against the yellow petals. Tree frogs need water to reproduce, either permanent ponds or temporary pools of water. This wet summer with all of its rain has left a lot of standing water around. Some areas around here have had water standing for a couple of months, long enough for tree frogs to lay eggs, hatch into tadpoles and develop into frogs. It’s always fun to spot one of these little guys. 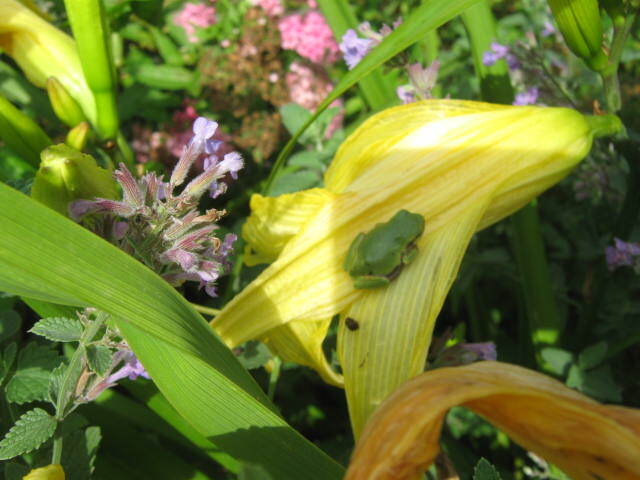 Like other frogs, they eat all sorts of insects which makes them helpful in the garden. They’re so much fun to watch too. Tree frogs blend in so well with their surroundings that it is hard to find them in their natural habitat up in the trees. They can surprise you by showing up in the most unusual places. Many of us have seen them resting on windows or stuck on the side of a building. One time I was happily surprised by one sitting on an apple I was about to pick. Adult tree frogs are about two inches long, ours are a little over half an inch right now. They range in color from gray, brown or green depending on their circumstances. 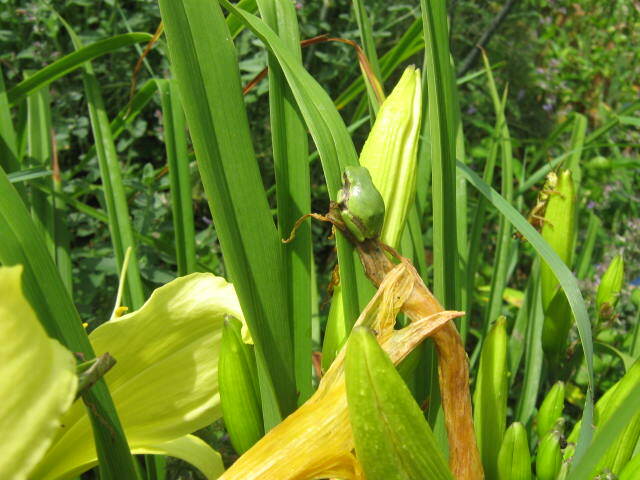 This tree frog is about the same width as the daylily leaf. It seems like tree frogs are loudest frogs we have around here. Their call is distinctive and carries quite a distance. Like bird songs, you can learn to identify them by their call even if you can’t see them. I don’t have to tell you we’ve had more rain than usual this gardening season in southeastern Michigan. Some locations, like my garden, have had significantly more rain than the official reporting stations because of localized heavy down pours. Don’t be surprised if you see a higher proportion of misshapen tomatoes in your garden this year be cause of this. If you’ve grown tomatoes for any length of time, I’m sure you’ve picked your share of distorted tomatoes. You may remember from your high school biology class that a tomato develops from the female parts of a flower — the ovary and ovule. Under good weather conditions the tiny, newly formed tomato grows and matures normally. But when the weather doesn’t cooperate, tomatoes can develop a number of different problems. 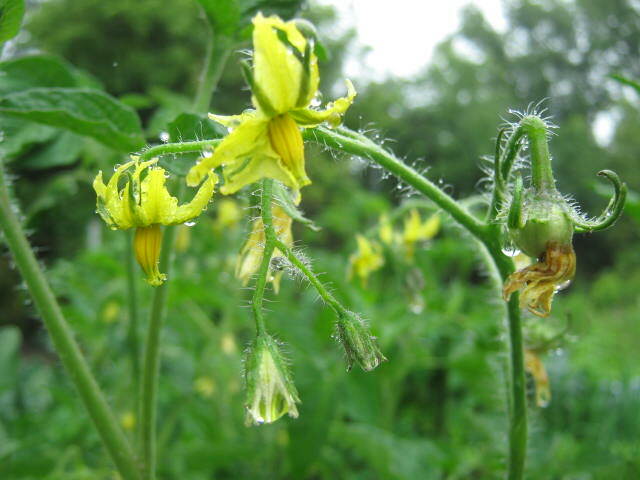 Tomato flowers on ‘Stupice’ heirloom variety. Tomatoes that have distorted areas with rough, brown edges are called “catfaced”. Although they are safe to eat, they don’t look very attractive. Catfacing is most often caused by flower petals sticking to the ovary just as the tomato begins to form. Rainy, damp weather keeps the petals from drying completely and separating from the rest of the flower. “Zippering” is another related condition caused by damp weather. The symptom is, a long, rough, thin brown scar running longitudinally — north pole to south pole — on the skin of a tomato. It’s caused by the anther, the male part of the flower, adhering to the young fruit as it grows. Sometimes an open locule forms along with zippering. A locule is a chamber inside the ovule that produces the fruit part of the tomato. An open locule is also called an “open hole”. It shows up as a dry, brown hole or depression on surface of the tomato. Those over-sized, distorted tomatoes that look like two or more tomatoes merged into one, are also caused by poor weather during flower development. Some varieties are more prone to these disorders than others — the “Beefsteak” varieties being one common example. I should stop here and mention “blossom end rot”. It is not related in any way to these disorders but is caused by inefficient movement of calcium inside the tomato. That is a discussion for another blog. Distorted tomatoes can also be caused by high soil nitrogen, excessive plant pruning, exposure to herbicides and tomatoes rubbing against one another. As the weather straightens out, tomatoes forming later in the season will have fewer catfacing and zippering symptoms at maturity.